Acorn Enterprise is on a mission to grow Scotland's entrepreneurial culture! Applications are now open for the 7th intake of their highly competitive 20 week Business Accelerator Programme. 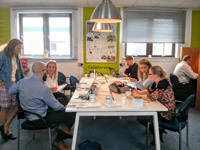 Acorn Enterprise are the experts at educating and accelerating new businesses and have won several awards, including: Virgin Media's Pioneer of the Week, the Sunday Times Maserati 100, Scotland's 40 UNDER 40, Scotland's Startup Britain Enterprise Champion and more! The 7th 20 week Business Accelerator Programme will run from Tuesday 7th February 2017 - Friday 30th June 2017, in Rosyth Business Centre, Fife.